Who is not talking about the weather? Last week was devastating to many of our CASE members! CASE PD chair, Gary Myrah (WI) has a saying, "There is no bad weather, just inadequate clothing!" He sent me a text this past week where he revised that statement after all the severe storms in Arkansas, Oklahoma, Louisiana, Alabama, Florida and so many other places. There are times when all the preparation in the world will not protect you. Our hearts go out to all who have been so affected by the weather this spring! This is the time of year budget really is a big part of your life. According to our poll last week, no one is "in the best financial shape" and 43 percent of you indicated you are pretty much in the same boat your were in last year! There was a tie between needing additional teachers but no additional funds and those of you who are truly tired of "creative budgeting!" 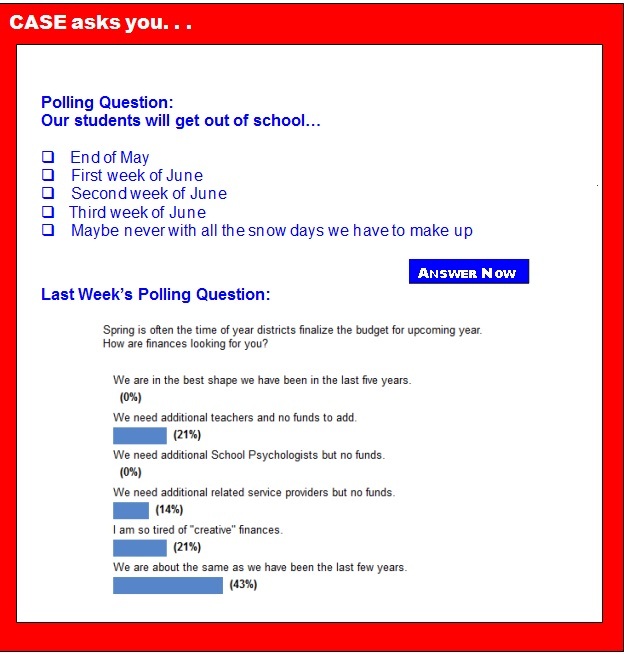 CASE and CEC continue to advocate for additional IDEA funds at the federal level and hopefully we give you tools to help you advocate at the local/state/provincial level. One of those tools is the CASE Educational Legislative Leadership Summit, July 13-16. Have you got a team attending the 12th Annual CASE Educational Legislative Leadership Summit, July 13-16, 2014? If not, make sure your state is represented in July. Go to the CASE website to register and click here for the flyer. This year as every year, it is very important for CASE to have as many different states represented up on the Hill for our visit on Tuesday, July 15. There are several really important national issues we will be working on in D.C., this year with our other association partners. Don't miss this great opportunity. And, with a hotel group rate of $149 at the Hilton Old Town, right across from the King Street Metro stop, this might be a great time to do a DC excursion for you and the family! Group rate ends June 17 so click here to make your hotel reservations! Click here to download a flyer. Be sure to read the article below about CEC's efforts on funding advocacy, Lawmakers press Duncan for more special education funding. And Don't Forget the CASE Career Center! If you haven't visited the CASE interactive job board at the CASE Career Center, now is a good time to do so! With its focus special education administrators and professionals, the CASE Career Center offers members, and school districts, a highly targeted resource for online recruitment. Both members and non-members can use the CASE Career Center to reach qualified candidates. Employers can post jobs online, search for qualified candidates based on specific job criteria, and create an online resume agent to email qualified candidates daily. They also benefit from online reporting providing job activity statistics to track each job posting's return on investment. For job seekers, CASE Career Center is a free service providing access to employers and jobs in education. In addition to posting their resumes, job seekers can browse or view jobs based on the criteria they find matches their goals best. Job seekers can also post confidentially with confidence or search anonymously by creating a Job Agent. Job Agents notify job seekers via email when jobs matching their criteria are posted eliminating the need to visit their online accounts daily to track new postings. Click here to go to the main site to either learn of new jobs, post your resume, or post your positions. There is a modest fee for posting positions on the site but we believe you will have a greater reach with this dedicated career center on our website — click here to become a job poster. In this blog, you'll get the scoop on all your favorite online hotspots like the Bookshare blog, Facebook, Twitter and Pinterest so that you can quickly reach our staff, get timely answers to your questions, learn about Bookshare products, trainings and events and connect with the broader community that supports people with print disabilities. Are you fully connected? If not, join us now! Key2Ed, Inc., in partnership with Ed21 Consulting Services, is sponsoring a training on IEP/ARD Facilitation & Conflict Prevention, June 25-26, 2014, in Arlington, Texas. IEP/ARD Facilitation & Conflict Prevention Training focuses on the value of a facilitated IEP meeting and how when it is used proactively and routinely, it benefits school personnel, parents, and, most importantly, students! As a result of participation in this training, attendees will have (1) an understanding of the FIEP process; (2) an understanding of the value and use of the FIEP process; and (3) actionable information necessary for process implementation in their program. This training has been developed by Key2Ed, Inc., foremost experts and practitioners in the field of facilitated IEP. Registration is limited to 70 participants, so please act quickly to secure your spot. Participants will receive a continuing education certificate in IEP/ARD Facilitation & Conflict Prevention. Download the Registration Form. For more information about the training, contact Cassie Velasquez at cassiev@key2ed.com. Does your Representative in Congress support increasing funding for IDEA? Now's the time to find out! Use CEC's Legislative Action Center to ask your Representative to join a bi-partisan group of lawmakers in urging President Obama to increase funding for IDEA in his FY 2015 budget proposal, which is expected next month. Led by Congressmen Huffman, D-Calif., Polis, D-Colo., McKinley, R-W.Va., and Harper R-Miss., this letter to President Barack Obama recognizes that Congress has failed to fulfill its pledge to fully fund IDEA and presses the President to get IDEA on a path to reaching full funding in ten years. Please join CEC in advocating for increased IDEA funding by asking your lawmakers to sign this letter — it only takes a minute using CEC's Legislative Action Center! Register now for NCII's next webinar on Tuesday April 29, 2014 from 3:00–4:15 p.m. ET. The webinar, So What do I do Now? Strategies for Intensifying Intervention when Standard Approaches Don't Work, will be presented by Dr. Sharon Vaughn of the University of Texas Austin and Dr. Rebecca Zumeta of NCII. In the webinar, Drs. Vaughn and Zumeta will discuss approaches to intensifying academic interventions for students with significant and persistent needs. The presenters will address four categories of practice for intensification, with an emphasis on combining cognitive processing strategies with academic learning. Special educators, school psychologists, interventionists, classroom teachers, and school and district leaders are encouraged to attend. Click here to register. Register now for CEC's National Legislative Conference and make YOUR advocacy footprint on the Hill this summer. School districts and special education interests in five states — Florida, California, Connecticut, Illinois and South Dakota — are partnering with a new, federally funded center at the University of Florida on an ambitious effort to transform their preparation of effective teachers and leaders serving students with disabilities. A recent hearing on President Barack Obama's FY 2015 budget proposal in the House Education & the Workforce Committee had one recurring theme — funding for special education is far too low for school districts across the nation. A new systematic literature review on the association between socioeconomic status and involvement in childhood bullying has led researchers to recommend universal policies to combat bullying. One of the most promising elements of common academic standards for students with disabilities, say experts in special education, is that they offer explicit connections from one set of skills to another. This is what an inclusive classroom looks like: Children with disabilities sit next to ones who've been deemed "gifted and talented." The mixing is done carefully, and quietly. Students don't necessarily know who's working at what level. Despite a court ruling 25 years ago that gave children with disabilities equal access to general education activities, change has been slow. Today, about 17 percent of students with any disability spend all or most of their days segregated. Children with severe disabilities can still expect that separation. A new survey finds that 7.5 percent of children aged 6–17 are taking some sort of prescription medicine for emotional or behavioral difficulties. It's a first look at the problem, and supports evidence that more and more U.S. kids are getting drugs for conditions like attention deficit hyperactivity disorder. The good news is that more than half of their parents said the medication helped their children "a lot." The troubling news is that low-income kids were more likely to be given such drugs. LaJeana Howie and colleagues at the National Center for Health Statistics used data from interviews of the parents of 17,000 children in 2011-2012 for the study. In order for our global society to develop solutions to pressing problems in an increasingly technology-driven and constantly changing world, we need to re-train our workforce to do what machines can't: to be enterprising, independent, and strategic thinkers — to be purposeful creators. This starts with changing the way students, especially the youngest ones, learn. More Americans are graduating high school than ever before, but students with disabilities remain far behind their typically-developing peers, a new report finds. Nationally, 80 percent of public high school students earned a diploma on time during the 2011-2012 school year, according to data released Monday from the U.S. Department of Education’s National Center for Education Statistics. While the number of students with disabilities obtaining diplomas also ticked up that year, just 61 percent of those with special needs graduated, the findings indicate. The state Department of Education sent a memo to school districts about how to comply with new legislation that requires schools to specifically screen for reading disorders like dyslexia and to provide services for students and training for teachers. It is the first directive the state has sent out regarding what will likely be an extensive array of requirements related to the package of dyslexia-related legislation laws enacted last year. Advocates have said that the new laws are only the first step, and that implementation and enforcement by the state and school districts will be critical. The law goes into effect next fall. What we think of as a learning disability could translate into real-life skills. The word “dyslexia” evokes painful struggles with reading, and indeed this learning disability causes much difficulty for the estimated 15 percent of Americans affected by it. Since the phenomenon of "word blindness" was first documented more than a century ago, scientists have searched for the causes of dyslexia, and for therapies to treat it. In recent years, however, dyslexia research has taken a surprising turn: identifying the ways in which people with dyslexia have skills that are superior to those of typical readers. A new systematic literature review on the association between socioeconomic status and involvement in childhood bullying has led researchers to recommend universal policies to combat bullying. Investigators say the behavior occurs among all socioeconomic sectors and that nearly one-third of all children are involved in bullying. This finding suggests bullying is a significant public health issue which can cause long-lasting health and social problems. The new review, published in the American Journal of Public Health, advises that policymakers should be wary of assuming that bullies are more likely to come from lower socioeconomic backgrounds. Physical activity is a fundamental building block for psychological and physical well-being throughout a lifespan. Unfortunately, most Americans are sitting more and moving less. This is especially a problem for our children who are being forced to sit still and cram for standardized tests while being deprived of physical activity. Most Americans agree that U.S. schools should be judged by how effectively they educate all of their students, including those from low-income families or with disabilities, and English language learners. Making sure that accountability systems support these goals is especially important as states move to assessments aligned with Common Core State Standards. Based on our research and observations of innovative programs in Chicago and New York, we have seen large-scale success in systems of schools that focus on essential elements. For starters, leaders of these schools focus relentlessly on improving the quality, consistency, and coherence of instruction, and have the time and resources to make real improvement possible.